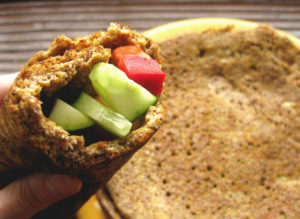 When looking for a protein rich snack, we stumbled upon these easy to make flaxseed wraps. Takes no time to make and then you can wrap your own treats – be it peanut butter and banana, veggies, chicken, or anything that strikes your fancy. Enjoy! Mix all ingredients together and blend well. Warm a 10-inch skillet. Add coconut oil to grease if you want. Pour in the batter and spread evenly across the bottom. Cook for about 3 minutes. Lift the edge with a spatula and slide onto a plate. Let cool for at least 5 minutes. Enjoy!